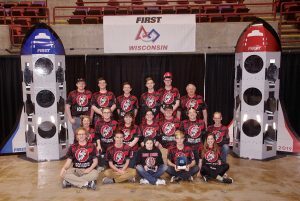 Linn-Mar Robotics Team 967 — the Iron Lions — recently competed in the Seven Rivers Regional Competition in LaCrosse, Wisconsin, finishing as the 10th-ranked team in the 54-team event. The Iron Lions won the Industrial Design Award sponsored by General Motors for their robot design. This award celebrates form and function in an efficiently designed machine that effectively addresses the game challenge. In the judges’ comments during the award ceremony, the robot designed by Team 967 incorporated 3-D printed technology in its manipulator design and gearbox assembly, which enabled the team to make quick changes for repairs or gearing changes. The robot scored both cargo (balls) and hatch panels (disks) quickly and reliably with the designed systems, making it one of the top scoring robots at the competition.